The ESPRESSO SPORT 800 is the higher spec model of the SPORT 600. The key feature of this bike is the integration of electronic gear shifting with the internal 8 speed SHIMANO Alfine hub. It’s a beautiful setup. On one hand, you control the level of power assistance with up/down buttons and on the other hand you control which gear you ride in with an identical switch. All this is monitored using the SHIMANO display that also connects to the motor and battery and measures a range of variables. This bike is designed primarily as a commuter bike. It’s higher price tag than the SPORT 600 is due to the electronic gearing, lights and rack and slightly up-graded running components. SHIMANO have been the first to integrate electronic gear shifting with their motor drive and it works seamlessly. Please come into our shop to test ride this bike and we’re sure you’ll be impressed. 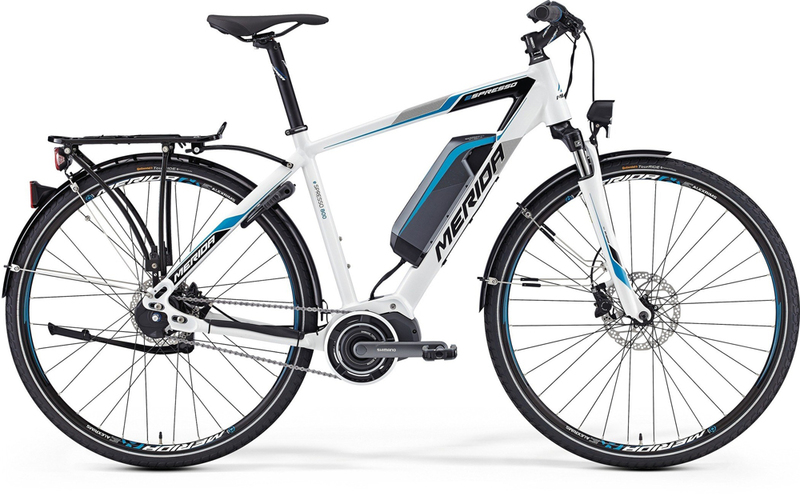 There is more information available from the MERIDA website here.